Calgary Fringe Festival: What's Happening Now? Find more Calgary arts and entertainment. How did we get a Calgary Fringe Festival anyway? The Fringe Festival in Alberta started in Edmonton. It began in 1982 and was in fact the first in all in North America, a "copycat" of a UK festivals. Like Calgary's, it centers on live theatre productions, with ancillary street performance art and other festivities making it all good. 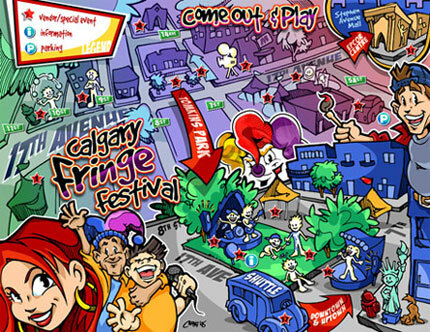 The Calgary Fringe Festival has been around in various configurations since 2000 when it took over from the Plan B festival. It's had a rocky start, but seems to be more stable now. It has grown steadily over time, both in duration and variety of performances. You will find it along 17 Avenue SW in August. This is when the red mile takes on a few other colours. Ever heard of the Canadian Association of Fringe Festivals? This non profit organization oversees all the festivals and even holds the Fringe and Fringe Festival trademarks in Canada, including Edmonton's and the Calgary's. Fringe festivals have become quite commonplace in this country. And there are now some in the USA, such as the Boulder Fringe Festival. Fringe is to live theater as Indie labels are to rock 'n roll. A little bit away from the well-trodden path. It also means that the rules can be a little more loose, without corporate or government pressures to conform to a standard. That is when art becomes real. The Calgary Fringe, like the others, can have a limited-budget, campy feel. Perfect! They appear to take pride in the fact that it is non-juried and uncensored, so artistic license prevails. Your chance to rave about a great production. Seen a good one? We all like great entertainment and I hope you did too. Was it a film festival, live theatre or otherwise? Maybe you'd like to let us all know about it. Here's your chance. Wanna send something? Great! Click the button and find it on your computer. Then select it. In a nutshell, it says that artists benefit from taking responsibility for their own success, although the Fringe will be of some help. The people of Calgary can achieve a sense of togetherness through the performing arts. Things such as open-mindedness and diversity serve as building blocks to this end. And so will "an environment of artistic freedom and expression." And more power to them. A city this size ought to have a thriving arts scene and so this is a good thing to see. If you want to see a more detailed map of the venue locations, download this recent one from the Fringe website. In subsequent years, this festival would likely use many of the same places, and more as it grows. Want to be involved? Ever thought you would like to be a part of the fringe. It could be worth it, an exciting place like this. If so, complete the Volunteer application at www.calgaryfringe.ca Go back from Calgary Fringe Festival to the Lifestyle Public Relations webpage now.